For Wind World (India) Limited's logistics operations, change is the only constant in the business dynamics; and no day is like another. 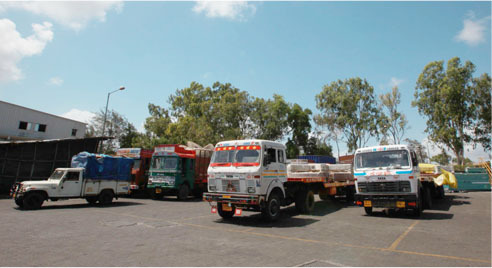 The fragmented and disorganized nature of the Indian logistics industry. Rules and regulations are just in the process of being standardized and every state follows their own procedures and practices. The ODC (Over Dimensional Consignment) nature of the cargo. Ensuring the safety of material transport across varied and challenging terrain. We have trailers of our own design, to provide a logistics solution to shift heavy turbine & Concrete Tower Segments. As the bulk of Wind World (India) Limited's moves are ODC (between 75-100 daily moves), Team Logistics is on call 24 X 7. Receiving demands from our factories and sites; getting quotes from vendors; ensuring trailer/vehicle placement on time; monitoring all major moves (between 150 -175 daily moves); ensuring unloading; and final billing & payment to transporters. On the safety front, considering the small and narrow village roads and tracks that a trailer carrying ODC has to negotiate, our major accident record is just 0.05 per cent. Indeed a commendable logistics achievement. Strict loading and lashing protocols, daily driver briefings on speed, safety and other parameters, and vehicle checks, are factors that contribute to our safety record. Wind World (India) Limited's Logistics team has grown from 4 to a 20 members, handling approx. 99% of Wind World (India) Limited's logistics requirements. The team's philosophy aptly defines their responsibility: 'At first, we move the blades and turbines; the wind then takes over from us'.